In 1843, a growing number of Irish citizens called for the repeal of the Acts of Union that combined Ireland and Great Britain. Daniel O’Connell, mayor of Dublin and a leader of the repeal movement, had held a series of rallies, called ‘monster meetings’, at various historical sites. When Prime Minister Robert Peel ordered the cancellation of a pro-repeal rally on 8 October 1843, O’Connell relented and called off the meeting. He was charged with conspiracy and sentenced to prison, and the repeal movement splintered. 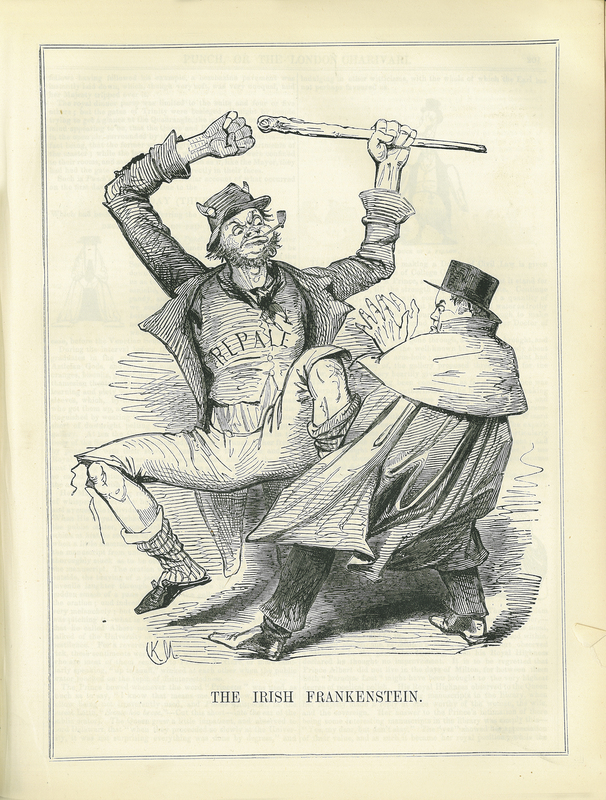 Punch shows O’Connell losing control of the forces of repeal, here represented in an ethnic stereotype that also takes the ‘monster meeting’ literally. Kenny Meadows, “‘The Irish Frankenstein’ in Punch, or the London Charivari,” ourheritage.ac.nz | OUR Heritage, accessed April 26, 2019, http://ourheritage.ac.nz/items/show/10853.